As debate rages over the Republican tax plan, Oregon unions launch a campaign for corporate tax transparency. IP 25, a measure introduced by SEIU Local 503 & Oregon AFSCME, would require publically-traded Oregon companies to disclose state-level tax information. "Good laws start with good information," SEIU Local 503 president Steven Demarest said in an email. "Public employees want to see effective corporate tax policy in Oregon because revenue from corporate taxes helps fund our schools, healthcare and other critical public services. 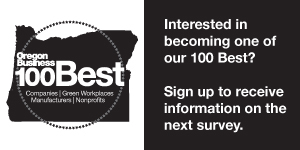 Increased transparency will provide the information Oregon needs to write effective and fair laws that work for everyone, including Oregon's businesses." If the new measure passes, corporations would give the Secretary of State information similar to what they already disclose at the federal level to the SEC. After a three-year waiting period, companies would report Oregon sales totals, how they computed their tax liability and what they paid after claiming credits and losses carried forward. Michael Mazerov, a senior fellow with the Center on Budget & Policy Priorities, a nonpartisan think tank that analyzes how state and federal budget choices impact low-income Americans, helped the unions prepare a report on corporate tax transparency in Oregon. Since then, he's been travelling around Oregon drumming up support for IP 25. The reporting requirements would also give legislators a clearer picture of how companies avoid taxes by keeping profits offshore. Nike, for example, holds $12.2 billion of its profits abroad. If the new measure becomes law, Nike would have to disclose payments to foreign subsidiaries and affiliates. Tax transparency at the state level is nothing new, Mazerov said. Around a dozen states have introduced corporate tax transparency laws in the past decade. In 1992, Massachusetts voters passed a corporate tax disclosure measure, Mazerov said, but legislators watered it down. But Jeff Newgard, a Pac/West lobbyist who focuses on corporate tax issues, says the Massachusetts measure had to be changed because it would have put the state out of compliance with federal disclosure laws, compromising its ability to access IRS data. Compliance issues have stymied previous tax transparency efforts in Oregon, Newgard said. "The roadblock is some of it would make [us] noncompliant with the law." To qualify for the 2018 ballot, IP 25 must collect 88,184 signatures. Corporate tax reform efforts in Oregon have been repeatedly foiled. Republicans have argued that a lower corporate tax rate grows traded sector companies and increase employment, making Oregon one of the best states in the country to do business. Democrats gave up on trying to raise the corporate tax rate at the end of the 2017 state legislative session. A 2016 ballot measure that would have taxed sales over $25 million was crushed after resistance from Leupold & Stevens, Greenbrier, Portland General Electric, Pacific Seafood Company, Bright Wood Corporation and a number of other companies, who argued that higher taxes would be passed on to consumers in the form of price increases. The problem with those debates, supporters of IP 25 say, is that no one really knew what they were talking about. Whatever side legislators take, transparency could lead to more informed decisions. “Companies will make claims,” Mazerov said, “and legislators have no ability to evaluate whether they’re true." This article has been edited to reflect the following corrections: The 1992 measure was passed in Massachusetts, not Oregon. Transparency measures have been introduced in a dozen states, but none have passed. The revised article also includes a comment from PacWest lobbyist Jeffrey Newgard.